In February, I visited sites relating to Dr Sutherland’s life between 1910 and 1921: Allsop Place NW1, London, where the St Marylebone Dispensary for the Prevention of Consumption once stood and where he served as medical officer from 1910-1914. Regent’s Park, site of the open-air bandstand school which he set up in 1911. The Church of the Immaculate Conception in Farm Street, Mayfair—in which Dr Sutherland was accepted into the Catholic Church in 1919 and 11 Chandos Street W1, home of The Medical Society of London—in which he listened to Dr Louise McIlroy in July 1921. In April, the British Film Institute placed Britain’s first public health education film, online, free-of-charge. 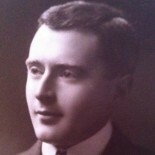 The Story of John M’Neil was produced by Dr Sutherland in 1911. It was a delight to see clear images from over 100 years ago play across the screen and to know that the original media is preserved digitally. In a society based on lies, tellers of truth must pay the price for their veracity. Sometimes this price is paid with suffering whilst they live; at other, the penalty is obscurity after death, no matter how accomplished they may have been, howsoever heroic or helpful to their fellow man they may have been. The latter punishment was meted out the Halliday Sutherland (1882-1960), the author of this book. Coulombe remarked that the book was “chillingly prophetic” and this 2018 BBC website article reveals why. As this website approaches its fifth anniversary, I am pleased to say that it is succeeding in its aims: the number of visitors to this site has increased and online searches produce results not blanks. The story of Dr Sutherland’s life is told from his point of view and not from the point of view of the biographers of his enemies. The nonsense that used to be written about him no longer goes unchallenged and, what’s more, challenged with credible historical evidence. The disciples of Stopes will continue to struggle to reconcile the irreconcilable, for if they really do disparage negative eugenics then why do they disparage the person who attacked it and laud he person who advocated it? They won’t like Sutherland’s Catholicism, nor his opposition to contraceptives, but surely he earns some credit in their eyes for opposing eugenics? …the underlying reason for the controversy was [Stopes’] alleged support for eugenics, the discredited science of racial progress. The Daily Mail has mounted a long campaign against her for her views and for sending a book of poetry to Adolf Hitler. On her son’s death in 2014, the paper called her “a monster of a mother”. Jenni Murray, presenter of BBC’s Woman’s Hour, indicated that she omitted Stopes from her 2016 book on groundbreaking women because of Stopes’s supposed support for eugenics. Stopes certainly used eugenic arguments when it suited her, but she was a maverick eugenicist. Her private correspondence, archived in the British Library, shows how she was shunned by the Eugenics Society. These letters, which I’ve studied, show how she clashed with them on the issue of compulsory sterilisation for the unfit and did not believe upper-class women should have more children “to improve the race”. Note the use of words alleged and supposed to cast doubt. It uses the weakest argument that she was a eugenist: that she sent a book of poems to Hitler. Stopes certainly used eugenic arguments when it suited her suggests she was opportunistic rather than a true believer. The description: a maverick eugenicist who was was shunned by the Eugenics Society suggests that she was on the outer of the movement rather than a leader. The statement that she clashed with the Eugenics Society on the issue of compulsory sterilisation for the unfit, suggests that she opposed it. Given the evidence of Stopes’ enthusiasm for eugenics (including, negative eugenics) these qualifying words do not so much change the reality as reveal the discomfiture of the writer. (My purpose here is to point out the dissonance and I addressed these points in a comment on the article). As I have said previously, this is not merely an historical exercise: it is relevant today. Eugenics is once more on the march and equipped with technology that the eugenists of Dr Sutherland’s era would have given their eye-teeth for (see this article, this article and this interview for more information). You might think: that there’s nothing to worry about. There are ethics panels cover these things, aren’t there. Are there? This report in the Wall Street Journal would suggest not. The assumption is that the people who professed to have the backs of the poor had it sorted, whereas the reality is that many socialists saw eugenics as a way to enable a socialist utopia. I publish these essays at the present time for a particular reason connected with the present situation: a reason which I should like briefly to empathise and make clear. Though most of the conclusions, especially towards the end, are conceived with reference to recent events, the actual bulk of preliminary notes about the science of eugenics was written before the war. It was a time when this these was the topic of the hour; when eugenic babies (not visibly distinguishable from other babies) sprawled all over the illustrated papers; when the evolutionary fancy of Nietzsche was the new cry among the intellectuals; and when Mr Bernard Shaw and others were considering the idea that to breed a man like a cart-horse was the true way to attain the higher civilisation, of intellectual magnanimity and sympathetic insight, which may be found in cart-horses. It may therefore appear that I sometimes took it too seriously. But the criticism of Eugenics soon expanded of itself into a more general criticism of a modern craze for scientific officialism and strict social organisation. Eugenics and Other Evils by G.K. Chesterton (1922). So whether you are a Roman Catholic or a certain kind of individualist liberal or not, stay alert! This entry was posted on 1 January 2019 by markhsutherland in Eugenics, Marie Stopes biography.